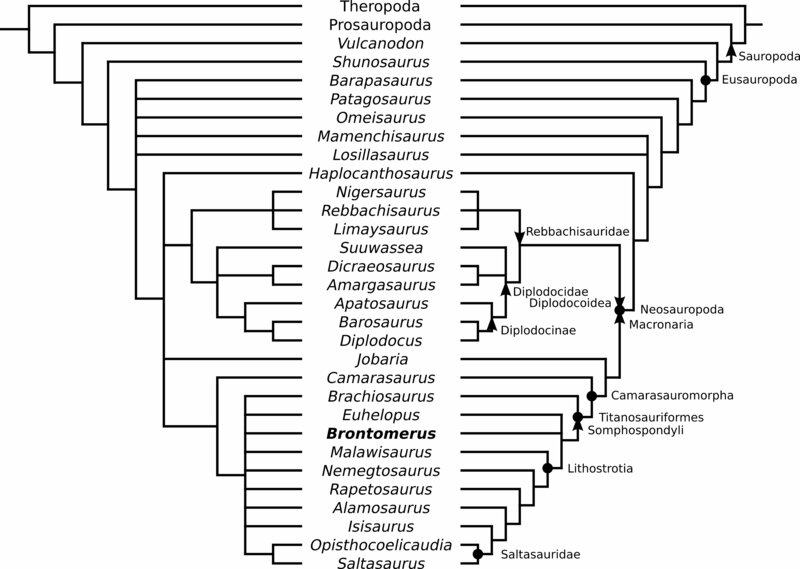 The Nexus file used to generate the cladistic analysis i.n the Brontomerus paper is available to anyone who wants to re-run or extend the analysis. My thanks to Jerry Harris, who gave me a copy of the Nexus file from his (2006) analysis. My file is based on his. The following high-resolution versions of the figures from the Brontomerus paper are made available under the Creative Commons Attribution licence. Fig. 1. Skeletal inventory of the camarasauromorph sauropod Brontomerus mcintoshi from the Lower Cretaceous Cedar Mountain Formation of Utah, in left lateral view. Preserved elements are white, missing elements are reconstructed in gray. After a Camarasaurus grandis reconstruction kindly provided by Scott Hartman. Fig. 2. 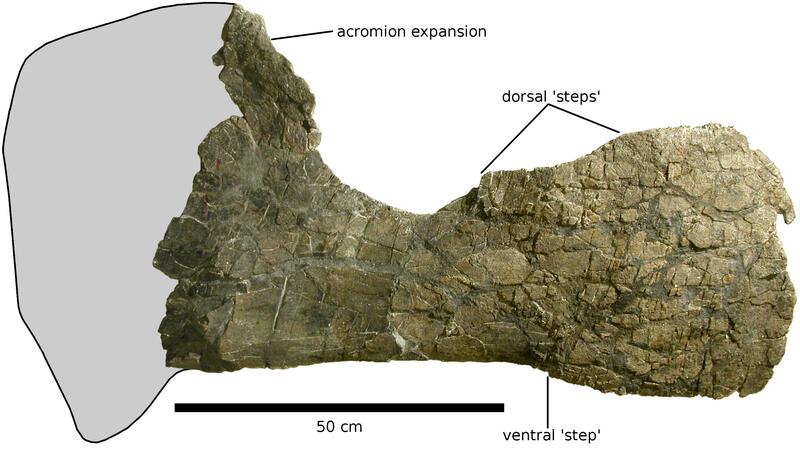 Left ilium of the camarasauromorph sauropod Brontomerus mcintoshi from the Lower Cretaceous Cedar Mountain Formation of Utah, type specimen OMNH 66430 in lateral view reconstructed from the three fragments (A), and ventral view (B). Fig. 3. Damaged presacral vertebra of the camarasauromorph sauropod Brontomerus mcintoshi from the Lower Cretaceous Cedar Mountain Formation of Utah, OMNH 66429, in dorsal view, as photograph (A) and interpretive drawing (B). Shading indicates air spaces. Fig. 4. 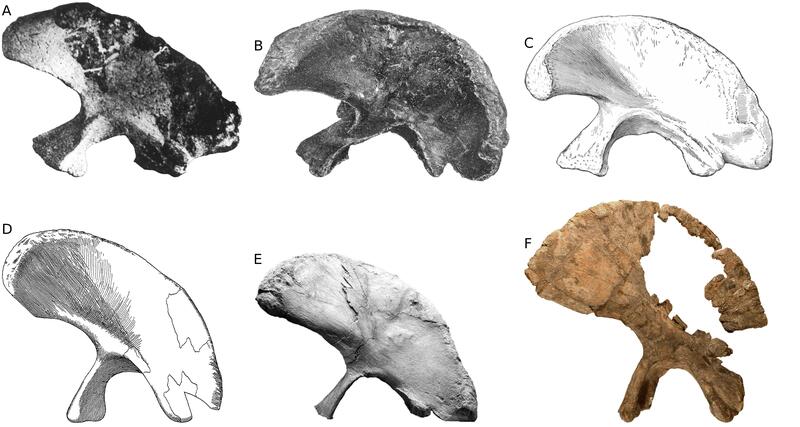 Mid-caudal vertebra of the camarasauromorph sauropod Brontomerus mcintoshi from the Lower Cretaceous Cedar Mountain Formation of Utah, OMNH 61248 in dorsal (A), anterior (B), left lateral (C), posterior (D) and ventral (E) views. Fig. 5. First right dorsal rib of the camarasauromorph sauropod Brontomerus mcintoshi from the Lower Cretaceous Cedar Mountain Formation of Utah, OMNH 27766 in posterior view: head of rib, showing pneumatic invasion of shaft (A) and complete rib, showing laterally directed curvature of shaft (B). Fig. 6. 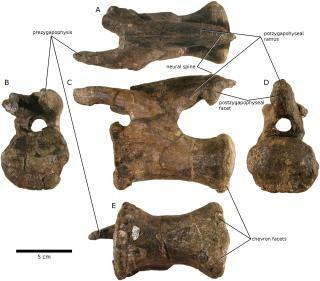 Partial left scapula of the camarasauromorph sauropod Brontomerus mcintoshi from the Lower Cretaceous Cedar Mountain Formation of Utah, OMNH 27761, in lateral view, tentatively reconstructed after Giraffatitan brancai HMN Sa 9 (Janensch 1961: pl. 15, fig. 1). Fig. 7. Partial paired sternal plates of the camarasauromorph sauropod Brontomerus mcintoshi from the Lower Cretaceous Cedar Mountain Formation of Utah, OMNH 66431 and 66432, in ?ventral view. Fig. 8. 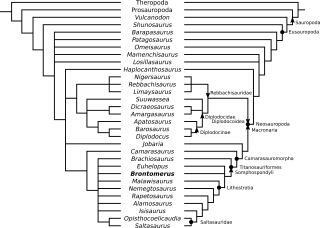 Phylogenetic relationships of the camarasauromorph sauropod Brontomerus mcintoshi from the Lower Cretaceous Cedar Mountain Formation of Utah, produced using PAUP* 4.0b10 on the matrix of Harris (2006) augmented by Brontomerus, having 31 taxa and 331 characters. Left side, strict consensus of 180 most parsimonious trees (length = 788; CI = 0.5228; RI = 0.6848; RC = 0.3581); Right side, 50 per cent majority rule consensus. Fig. 9. Ilia of sauropod dinosaurs, scaled to same total length. Mamenchisaurus hochuanensis holotype CCG V 20401, right ilium reversed, modified from Young and Zhao (1972: pl. 6, fig. 1a) (A); Diplodocus carnegii CM 94, right ilium reversed, modified from Hatcher (1901: pl. X, fig. 1) (B); Camarasaurus supremus AMNH 5761 Il. 1, left ilium, modified from Osborn and Mook (1921: fig. 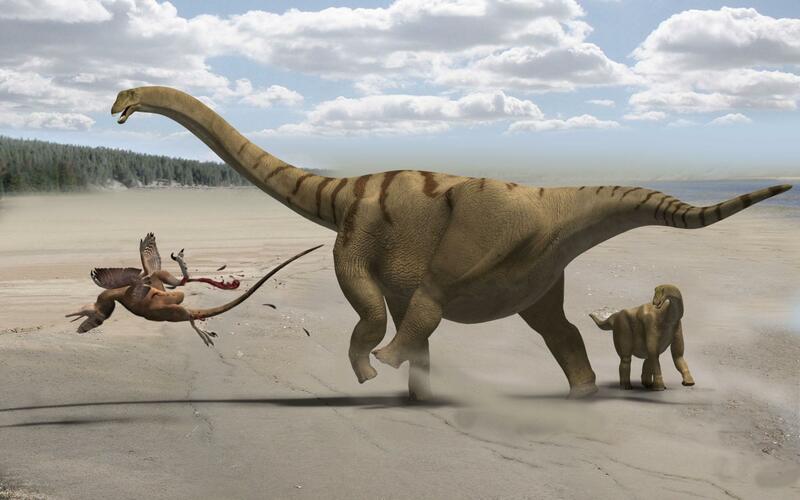 87) (C); Giraffatitan brancai HMN J1, left ilium, modified from Janensch (1961: pl. E, fig. 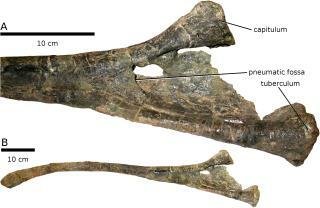 2) (D); Rapetosaurus krausi holotype FMNH PR 2209, left ilium, modified from Curry Rogers (2009: fig. 39B) (E); Brontomerus mcintoshi holotype OMNH 66430, left ilium (F). Fig. 10. Measurement protocol for sauropod ilia as illustrated in Fig. 9 and shown in Table 4. 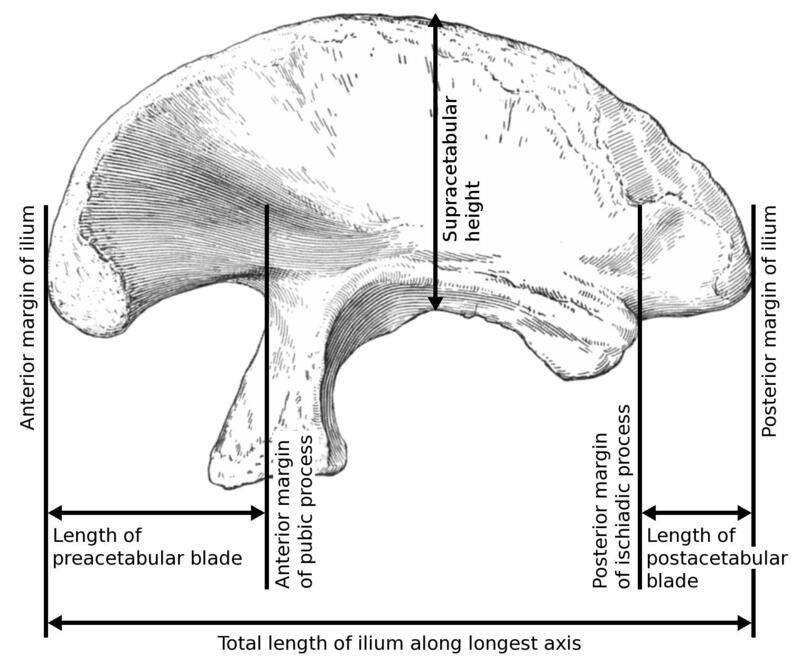 Total length is measured along the longest axis of the ilium; lengths of preacetabular and postacetabular lobes are measured parallel to this axis, and extend from the extremity of the lobe to the anterior margin of the pubic peduncle and posterior margin of the ischiadic peduncle respectively. Supracetabular height is measured perpendicular to the longest axis, and extends from the highest point of the acetabulum to the point level with the highest part of the ilium. Fig. 11. 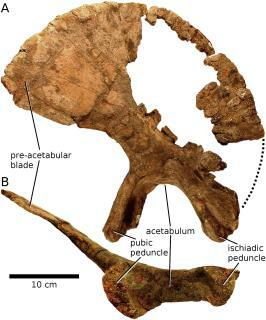 Scapulocoracoids and scapulae of sauropod dinosaurs, scaled to same length of scapular blade from posterior point of glenoid to posterior margin of blade. Mamenchisaurus youngi holotype ZDM0083, left scapulocoracoid, modified from Ouyang and Ye (2002: fig. 22) (A); Diplodocus longus USNM 10865, right scapulocoracoid reversed, photograph by MPT (B); Camarasaurus supremus AMNH 5761 Sc. 1, left scapula, and AMNH 5761 Cor. 1, left coracoid, probably associated, modified from Osborn and Mook (1921: figs. 75, 81a) (C); Giraffatitan brancai HMN Sa 9, left scapula, modified from Janensch (1961: pl. 15, fig. 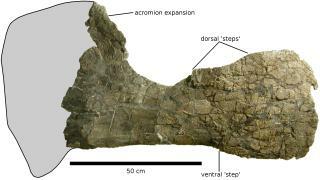 1) (D); Rapetosaurus krausi holotype FMNH PR 2209, right scapula reversed, modified from Curry Rogers (2009: fig. 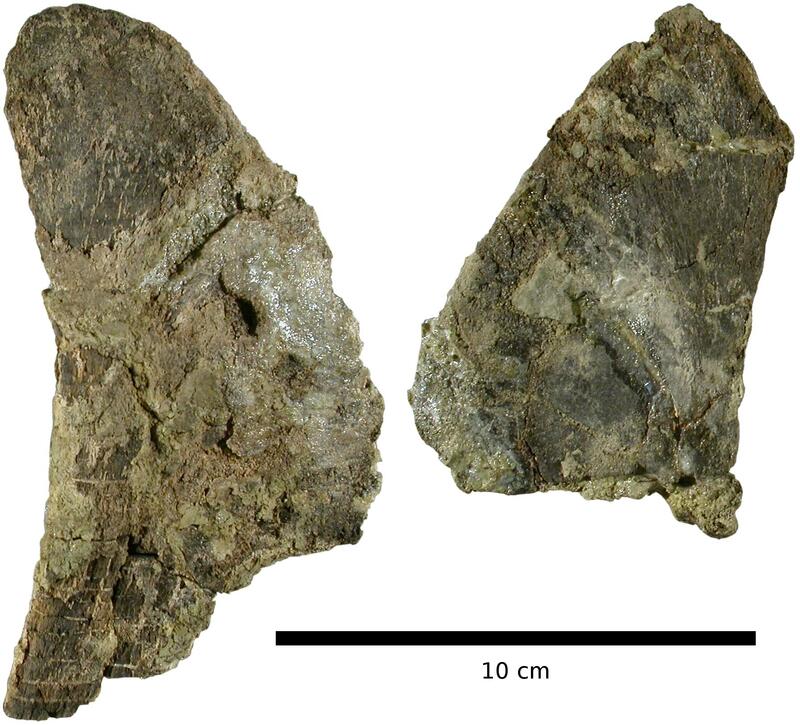 32) (E); Brontomerus mcintoshi OMNH 27761, left scapula, tentatively reconstructed after Giraffatitan brancai (F). Fig. 12. Speculative life restoration of the camarasauromorph sauropod Brontomerus mcintoshi from the Lower Cretaceous Cedar Mountain Formation of Utah. Adult individual (sized according to the referred scapula) protects juvenile (sized according to the holotype ilium) from a Utahraptor: the enlarged femoral protractors may have enabled a powerful kick. By Francisco Gasc�. Reproduced with permission. I am providing these specimen photos, with no description or comment, for the benefit of anyone who wants to compare Brontomerus with other taxa and needs more detail than is in the paper. They are made available under the Creative Commons Attribution licence.